I really enjoyed the first half of While We’re Young, the new film by writer-director Noah Baumbach (The Squid And The Whale, Greenburg). 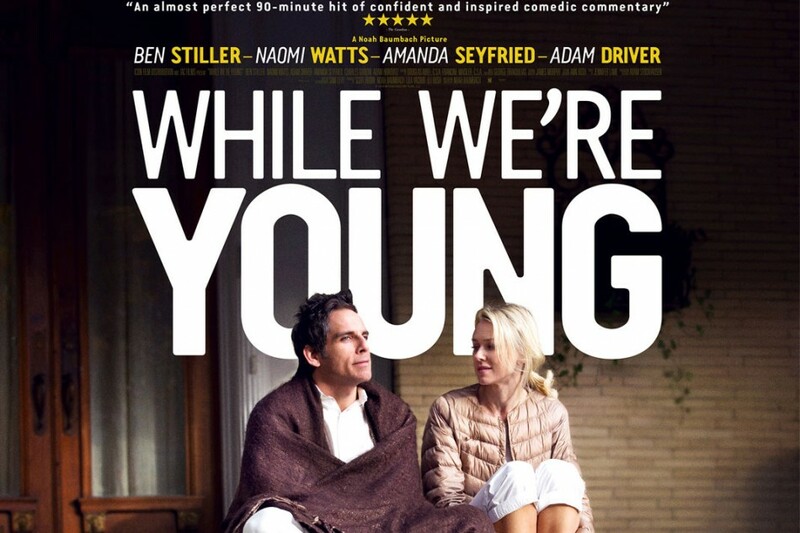 I was laughing out loud and identifying with the middle aged, childless couple played by Ben Stiller and Naomi Watts. I was recognizing the 20 something, millennial couple played by Adam Driver and Amanda Seyfried, as the people I now hang out with when I’m in bars. It was a fish out of water concept that is perfect for today. How do the hipsters of the 80s, the old school hipsters, relate to the modern day hipsters? But the second half of the film goes in a wrong direction. It becomes predictable and focuses on Ben Stiller’s ‘daddy issues’ and insecurities, making the younger couple a thing to be wary of and demonizes them. It turns bitter. Noah Baumbach’s films do deal a lot with insecurity and now that he is 45, it’s middle aged insecurity. Josh (Stiller) and Cornelia (Watts) are starting to feel in a rut. Most of their friends have started families and seem to be moving forward with their lives. They tried to have a child but were unable to and now feel out of step. Josh is a documentary filmmaker whose first and only film was well received but he has been laboring on his follow up for 10 years. Cornelia’s father (Charles Grodin) is a famous documentary filmmaker which intimidates Josh who refuses his help but still longs for his approval. Josh meets a young couple, Jamie and Darby (Driver and Seyfried) who come to one of his classes on filmmaking and Jamie claims to be a big fan of his film and as it happens also wants to be a documentary filmmaker. The two couples become friends and start doing everything together which leads to the funny montage of how these old folks struggle to hang with the youngsters yet start to feel rejuvenated and excited by life again. All of this is engaging and funny and I like all the characters. Jamie tells Josh about an idea he has for a short film. He’s going to start a Facebook page and the first person to friend request him he will go and meet and film it. It strikes Josh as not enough for a film but he ends up agreeing to help. The first person is a high school friend that he greatly admired. They find that he is in a mental ward due to a suicide attempt. They go there to film their meeting and it turns out to be interesting. Then Josh ‘Googles’ the guy and finds out that he was a decorated soldier. The little idea is turning out to be a gold mine. But here is where the film turns. Josh starts getting jealous of Jamie. When they run into Cornelia’s famous father (Grodin) Jamie ingratiates himself and seeks him out behind Josh’s back. There is even a scene where they all attend a ‘spiritual’ ritual where they all do peyote and go on a trip and Cornelia ends up making out with Jamie. The second half of the film is about Josh finding out that Jamie has been playing him all along. He knew who he was married to. He knew that her father was a famous documentary filmmaker. He already knew the guy he wanted to shoot his film about and knew all about his past. Josh and Cornelia’s relationship is tested. Josh feels his father in law like Jamie better. They don’t have a kid and all their friends have kids and he can’t seem to make his own short film work. I know you need conflict in a story. I know you need to keep it moving and interesting but I didn’t like the way the movie turned on the young couple. The view of the movie is that these young people are opportunists and immoral and have no scruples. I would have liked to see the movie just be about the 2 couples and how they influence each other and what they inspire each other to become. Maybe there is less traditional conflict there but it would have been more interesting, perhaps more of a character study of these 4 people. It would have been more of a 70’s movie. Perhaps Baumbach was trying to be more commercial, seeking that commercial success that has eluded him. That’s fine but it could have been so much more.